A major new exhibition of music memorabilia, featuring David Bowie’s ripped Ziggy Stardust shirt, will take place in honour of the historic British music venue Aylesbury Friars from Monday March 1st. Featuring rare memorabilia relating to David Bowie, Lou Reed, Genesis, The Ramones, Talking Heads, The Clash, Roxy Music and Queen, “The Evolution of Friars” music exhibition includes concert posters, original photographs, paraphernalia from Friars’ archives, and musical instruments and equipment used by some of the most prestigious names to pass through Friars’ doors. 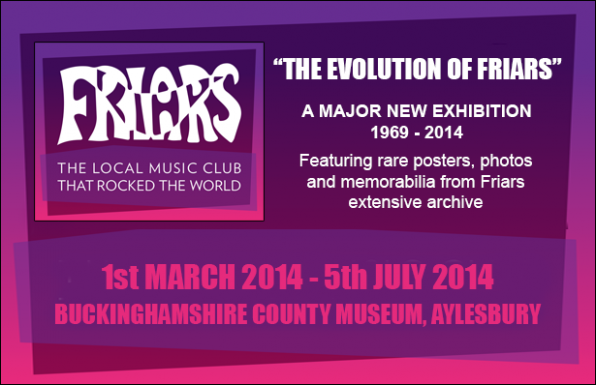 The exhibition will be housed at the Buckinghamshire County Museum, read the full press release HERE. Friars’ most memorable night took place on January 29th 1972, when David Bowie chose the venue to perform as Ziggy Stardust for the very first time. The birthplace of one of the UK’s most culturally significant icons, a section of Stardust’s satin sequined shirt, which was ripped-off by overzealous fans during the concert, will be on show at the exhibition. Vivian Symonds, one such fan who managed to come away with a piece of Bowie’s shirt, will be at the opening night of the exhibition. Ms Symonds is also available for interview.